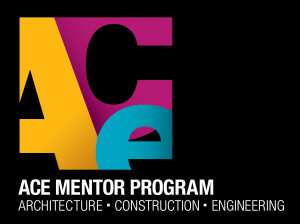 As the design and construction industry’s fastest-growing high school mentoring program, ACE reaches over 8,000 students annually. Nationally, over $12 million in scholarships have been awarded and countless young lives have been positively affected. ACE relies on a network of volunteer mentors ranging from architects and engineers to construction managers, contractors, and subcontractors. The program emphasizes all aspects of design and construction industry careers – from professional college career paths to those in the building trades. By informing and exposing students to the myriad construction career options, ACE is helping to build a talented construction workforce for the future. ACE follows a group-mentoring model. Eight to ten mentors representing different disciplines serve each team of 20-30 students. From November until May, teams meet biweekly after school to experience a comprehensive design and building process. Teams visit mentors’ offices, take field trips to construction sites, and gather in a year-end event to present their projects to assembled mentors, family, and friends, much as an actual design team presents to clients. The program offers exposure to all facets of ACE careers, from experiencing offices and jobsites to creative design and collaboration. ACE Eastern Pennsylvania especially needs contractor and subcontractor mentors to contribute their knowledge and experience to our teams. Mentors are welcome to sign up as individuals; ACE will assign mentors to teams where their expertise is most needed. If you would like to get involved, visit http://www.acementor.org or contact the ACE Eastern Pennsylvania Affiliate Director, Tiffany Millner, AIA, NOMA, at 215-820-8929 or easternpa@acementor.org.